Kristoff St. John (July 15, 1966 – February 3, 2019) was an American actor. From 1991 to 2019, he portrayed the role of Neil Winters on The Young and the Restless, which earned him eleven Daytime Emmy Award nominations, two Emmy Awards, and ten NAACP Image Awards. 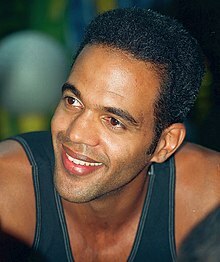 Kristoff St. John was born July 15, 1966, in New York City and grew up in Bridgeport, Connecticut, and Los Angeles. His father, Christopher St. John, is a producer, actor and director, while his mother, Marie, is an entertainer. As a ten-year old child, St. John had a featuring role on the Saturday-morning comedy Big John, Little John, broadcast on NBC in 1976. St. John portrayed a young Alex Haley in the 1979 ABC miniseries Roots: The Next Generations. He also made a small appearance as Booker Brown on the ABC sitcom Happy Days, as well as a boyfriend of Denise Huxtable on an early episode of The Cosby Show. In his first major role, he appeared as Charlie Richmond, Jr. in the 1985 CBS sitcom Charlie & Co.
As a ten-year old child, St. John had a featuring role on the Saturday-morning comedy Big John, Little John, broadcast on NBC in 1976. St. John portrayed a young Alex Haley in the 1979 ABC miniseries Roots: The Next Generations. He also made a small appearance as Booker Brown on the ABC sitcom Happy Days, as well as a boyfriend of Denise Huxtable on an early episode of The Cosby Show. In his first major role, he appeared as Charlie Richmond, Jr. in the 1985 CBS sitcom Charlie & Co.
St. John was married and divorced twice. He had a son, Julian (1989–2014) and a daughter, Paris Nicole (born 1992) with his first wife, boxer Mia St. John. Julian died by suicide on November 23, 2014 following a long history of mental illness. St. John was married to Allana Nadal from 2001 to 2007, and they had a daughter, Lola (born April 15, 2003). On August 31, 2018, he was engaged to Russian model Kseniya Olegovna Mikhaleva. St. John died at his Los Angeles, California, home on February 3, 2019. 1 2 3 Slotnik, Daniel E. (February 4, 2019). "Kristoff St. John, a Fixture of Daytime TV, Is Dead at 52". The New York Times. ISSN 0362-4331. Retrieved February 5, 2019. ↑ Daniel Wilcox & Thad Mumford (writers); Georg Stanford Brown (director) (1979-02-22). "Part 5". Roots: The Next Generations. ABC. ↑ James Ritz (writer); Jerry Paris (director) (1976-01-20). "Football Frolics". Happy Days. Season 3. Episode 18. ABC. ↑ John Markus (writer); Jay Sandrich (director) (1984-11-15). "How Ugly Is He?". The Cosby Show. Season 1. Episode 9. NBC. ↑ Petski, Denise; Petski, Denise (February 4, 2019). "Kristoff St. John Dies: 'The Young & The Restless' Actor Was 52". Deadline. Retrieved February 5, 2019. 1 2 3 4 5 6 7 8 Rubin, Rebecca; Rubin, Rebecca (February 4, 2019). "'Young and the Restless' Star Kristoff St. John Dies at 52". Variety. Retrieved February 5, 2019. ↑ Arnowitz, Leora; Thompson, Julia (February 6, 2019). "Kristoff St. John's final 'Young and the Restless' scene airs, leaving fans in tears". USA Today. Retrieved February 6, 2019. ↑ "Kristoff St. John's Son Julian Dead at 24". Soaps.sheknows.com. November 29, 2014. ↑ "My Lil Lola Lemon is Officially a Teenager Today". Instagram.com. April 15, 2016. ↑ Pasquini, Maria (September 3, 2018). "The Young and the Restless Star Kristoff St. John Is Engaged to Russian Model Kseniya Mikhaleva". People. Retrieved February 5, 2019. ↑ "Emmy Award Winner Kristoff St. John Shows His Skin to Save Animals' Skins". PETA.org. ↑ "Taking it Off for PETA". SoapOperaDigest.com. July 12, 2004. ↑ SOD (February 4, 2019). "Beloved Y&R Star Kristoff St. John Dies". Soap Opera Digest. United States: Odyssey Magazine Publishing Group Inc. American Media, Inc. Retrieved February 4, 2019. ↑ Corinthios, Aurelie (February 4, 2019). "Young and the Restless Star Kristoff St. John Dead at 52: Report". People. Retrieved February 4, 2019. ↑ Reed, Anika (February 4, 2019). "'Young and the Restless' star Kristoff St. John dead at 52, cause 'deferred'". USA Today. Retrieved February 6, 2019. 1 2 3 4 5 6 7 "Kristoff St. John". TV Guide. Retrieved February 5, 2019. ↑ Respers, Lisa (February 4, 2019). "Kristoff St. John, star of 'Young & the Restless,' dead at 52". CNN. Retrieved February 5, 2019. ↑ Goudas, John N. (May 26, 1990). "Emmy nominees announced". TimesDaily. Florence, Alabama: Tennessee Valley Printing Co. p. 70. Retrieved May 6, 2013. ↑ "1991 Emmy Winners & Nominees". Soap Opera Digest. New York City: American Media, Inc. Archived from the original on August 18, 2004. Retrieved May 6, 2013. ↑ Associated Press (June 25, 1992). "CBS Takes Home Most Daytime Emmys : Television: 'All My Children's' Susan Lucci, nominated 13 times, gets a standing ovation--but no best actress award". Los Angeles Times. ISSN 0458-3035. Retrieved February 6, 2019. ↑ "1993 Image Award Winners". UPI.com. January 17, 1993. Retrieved September 5, 2016. ↑ "1994 Image Award Winners". IMDb. Retrieved August 2, 2016. ↑ Snow, Shauna (February 22, 1996). "5 Films Head Nominations for NAACP Image Awards". Los Angeles Times. Retrieved January 21, 2017. ↑ Bonawitz, Amy (February 11, 2009). "34th Annual Daytime Emmy Winners". CBS News. Retrieved January 8, 2013. ↑ Silverman, Stephen M. (June 21, 2008). "Ellen DeGeneres, Tyra Banks Win Daytime Emmys". People. New York City. Archived from the original on March 18, 2018. Retrieved May 7, 2013. ↑ Couch, Aaron (February 1, 2013). "2013 Image Winners". The Hollywood Reporter. Retrieved August 2, 2016. ↑ Couch, Aaron (February 22, 2014). "2014 Image Winners". The Hollywood Reporter. Retrieved August 2, 2016. ↑ "The 42nd Annual Daytime Emmy Award Nominations" (PDF). New York City: emmyonline.org and National Academy of Television Arts and Sciences. March 31, 2015. Archived from the original (PDF) on March 31, 2015. Retrieved March 31, 2015. ↑ "The 43rd Annual Daytime Emmy Award Nominations" (PDF). New York City: emmyonline.org and National Academy of Television Arts and Sciences. March 24, 2016. Archived (PDF) from the original on March 24, 2016. Retrieved March 24, 2016. ↑ "The 44th Annual Daytime Emmy Award Nominations" (PDF). New York City: emmyonline.org and National Academy of Television Arts and Sciences. March 22, 2017. Retrieved March 22, 2017.